The kids had only ever visited one amusement park, Canada’s Wonderland, and that first visit was a great success. So they were really excited to go to the one amusement park in New Jersey during this trip. Little did they know they’d be visiting a lot more than just the one in New Jersey! When we went to that park, it was cheaper to buy a season pass than to buy a ticket for the day. And I don’t mean it would work out cheaper if we visited more than once… it was actually $5 cheaper to buy the season pass. I don’t understand why anyone would buy the day pass! Anyway, I purchased season passes for everyone, and these passes are good for all Six Flags locations. So we figured we’d just hit up several of the parks along our route, much to the delight of the kids and I, and much to the despair of my husband. Just kidding. Anyway! 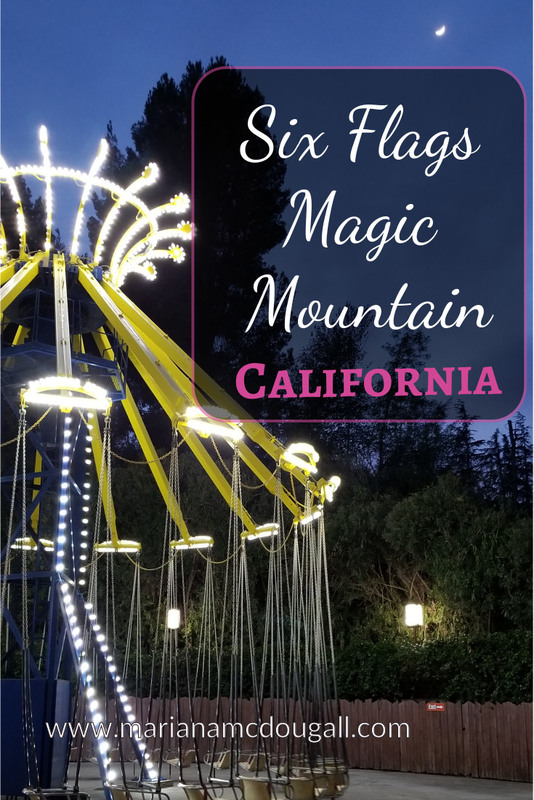 We’ve so far hit up Six Flags Great Adventure in New Jersey, Six Flags Over Texas, Six Flags Fiesta Texas, and the latest one, Six Flags Magic Mountain in California. 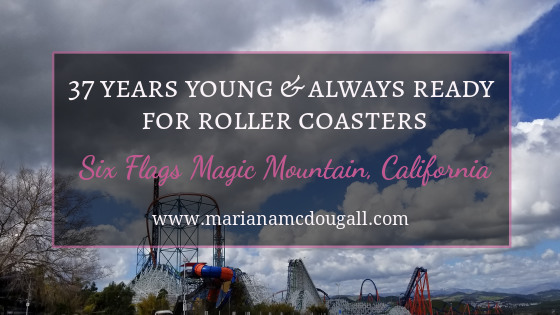 We decided not to go to the San Francisco Six Flags, because after three days at an amusement park, Dan was pretty done with rides, and to be honest, my body can’t take that much excitement anymore, either. My arthritis starts acting up, and my back seized up on the second day (but I was able to get myself back in shape again with some stretching and self-massage). Because I was still struggling with my injured toes and ankle, knees that constantly give out, and a back that isn’t cooperating, I rented a scooter for the third day, which also happened to be my birthday. I also have a cane that’s been helping me with my feet issues, so I carried that as well. And of course, I wore all the braces. As usual, I was self-conscious about using all this stuff, but it’s what I needed to do to get through the day without doing a number on my back, and in the end, I’m glad I did what I had to do, despite the judgement people pass. Saving me from all-day walking meant I was able to go on more rides, because my back wasn’t sore and seizing up from being on my (already sore) feet all day. At that time, I could walk at the park all day, or I could go on rides, but I couldn’t do both. So I chose the rides, and I’m glad I did. We went on some super fun rides. The Justice League: Battle for Metropolis had us fighting villains to save the city, and it was a blast. The 3D effects really made it look like we were outside on the streets, fighting crime. We especially enjoyed that the cars sit 5 people, so we were all able to ride together. The displays as you wait for the ride were pretty impressive, and reminiscent of some of the waiting areas for rides at Disney World. My absolute favourite ride was the Twisted Colossus, which K-girl, G-boy, and I were able to ride together (3 times!). It’s a “hybrid coaster” in that it’s made of wood but has metal railings. I love this kind of roller coaster, because the metal rails smooth the ride, but it’s still pretty sweet to have the wooden supports. It’s a super long one too, and it’s pretty intense. It’s been featured in a number of films as well, which is cool! I could go into all the nitty-gritty of why this is such a great ride, but this website that I seem to be linking to a lot lately has already done that job, and done it incredibly well: check out the Trip Savvy review of the Twisted Colossus. There were other wonderful rides, too, Goliath being G-boy’s favourite. I can’t believe this 6-year-old kid is this excited about giant drops. K-girl also enjoyed this ride a lot, but I think the Twisted Colossus was her favourite. M-girl was still too little for these rides, but she still put Daddy through a few Buccaneer (the swinging boat) rides. The kid’s attractions at this park were pretty sweet as well. We enjoyed a number of kiddie-coasters and the kids had fun at Pepe Le Pew’s Tea Party, the Carousel, and a number of others. But M-girl’s favourite ride was, believe it or not, Ninja. That kid can’t wait ’till she can ride the wild coasters with her brother and sister. I had a great day celebrating my 37th birthday. We went on a bunch of rides, enjoyed a fun day at the park, and then sang happy birthday over some ice cream instead of cake, back at the RV. I can’t think of a better way to celebrate my birthday: being with the people I love, riding roller coasters, singing together, and having a treat. What has been your favourite birthday celebration?